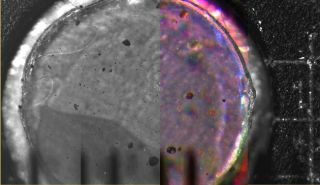 This mosaic of four side-by-side microscope images (one a color composite) was acquired by the Optical Microscope, a part of the Microscopy, Electrochemistry, and Conductivity Analyzer (MECA) instrument suite on NASA's Phoenix Mars Lander. Taken on June 3, 2008, the image shows a 3 millimeter (0.12 inch) diameter silicone target after it has been exposed to dust kicked up by the landing. Plans todeliver a sample of Martian soil to the Phoenix Mars Lander's instruments weredelayed again after a communication glitch, mission controllers said on Thursday. However, scientistswere able to examine images of some of the Martian dust and sand taken inprevious days by the lander's opticalmicroscope. The glitchoccurred when NASA's Mars Odyssey Orbiter, through which mission controllershave been communicating with Phoenix, went into safe mode Wednesday afternoonafter an energetic particle disrupted the orbiter's memory. Phoenix had beenprimarily communicating with Odyssey after a different problem temporarilydisabled the Mars Reconnaissance Orbiter (MRO) last week. Phoenix is now communicating with MRO againwhile Odyssey is brought back to life, which mission controllers expect couldhappen in the next few days. When Odyssey is fixed, the lander will have theoption of communications with both orbiters. Because ofthe glitch, instructions to scoop up a soil sample were sent to the Phoenix a day later than originally anticipated. Once scientists have confirmed the scoophas enough soil, they will deliver the sample to the lander's Thermal andEvolved-Gas Analyzer (TEGA) on Friday. Without its digging instructions, Phoenix instead ran one of its back-up sequences, which includes taking more images of thelanding site. Phoenix also ran a back-up sequence on May 30, whenthe mission team missed an earlier day of sending instructions due to the MROglitch. On a morepositive note, mission scientists got data back from the lander's opticalmicroscope, which looked at particles that were kicked up into the atmosphereby Phoenix's thrusters during its landingon May 25. The imagesfrom the microscope show what the leader of the mission's geology team, TomPike of University College London, described as "a very wide varietyof particles, both in coloration and size." They are thehighest-resolution microscopic images taken of the Martian soil to date ? 10 timeshigher than the images taken from the Mars Exploration Rovers, Spirit and Opportunity. Among thetypes of particles seen in the images are "a classic Martian, reddishbrown particle," that likely gives the surface its ruddy hue, Pike said.The images also show "black, almost glassy particles that have been kickedup by the retrorockets," he added. Because theparticles weren't delivered by the robotic arm scoop but rather settled ontothe spacecraft after landing, "we don't have a guarantee that these are Martianparticles," said Michael Hecht, the lead scientist for the Microscopy,Electrochemistry and Conductivity Analyzer (MECA) instrument. But missionscientists are fairly certain they are from Mars, as the microscope was checkedout before liftoff and during its cruise to Mars and no particles wereapparent. Extremelyfine particles can be seen in the background of the images, and are likely theparticles that are most easily blown up into the Martian atmosphere, giving theplanet's sky its pinkish color. Scientistsalso saw pale, whitish particles in the microscope images that could possiblybe the same whitishmaterial they have observed in the soil samples scooped up from thesurface. They won't be able to confirm this though until soil samples aredelivered to the microscope by the scoop. Scientistshave proposed that the white chunks seen in the scoop could either be ice fromjust below the surface or some kind of salt mineral. But the tiny paleparticles in the microscope are definitely minerals, as "any ice that wecollect would be slowly subliming," Pike explained. It ispossible that on future digs, the soil could be transferred to the microscopequickly enough to be imaged, Pike said. But that isn't the primary goal of themicroscopic experiments, Hecht said, which are geared at determining thehistory of the particles, for example what environment they might have formedin, by looking at properties such as their transparency and size. Mission scientists aren't worried aboutmissing a second day of the mission, they said, because they budgeted for missingone third of the scheduled 90-day mission while still being able to completeall of their research goals.